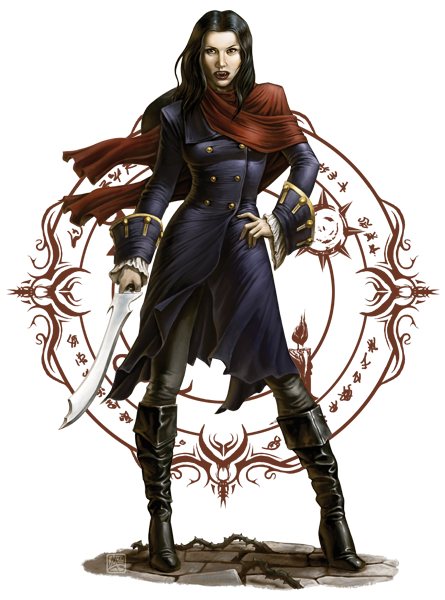 Accursed is a complete setting for Savage Worlds, to be published by Melior Via. In Accursed, Hellboy meets Solomon Kane. The game world allows players to take on the roles of characters transformed by curses. 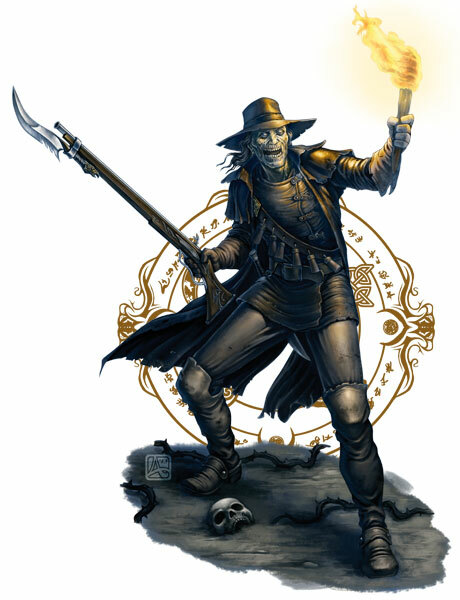 They are Dhampir (Half-vampire charming rogues), Golems (living creatures crafted from unloving materials, similar to Frankenstein’s monster), Vargr (werewolves), Mummies, Mongrels (men with bestial limbs and other body parts grafted onto their bodies), and Revenants (the living dead). The Accursed are this world’s only hope—they must learn to embrace their curse or to fight against it, and find some way to free themselves forever of their Witchmark. The three of us—Ross Watson, Jason Marker, and John Dunn—really enjoyed working together on projects with Fantasy Flight Games. After a few projects, we started talking about working on something collaboratively of our own creation. We passed a number of different ideas around, and the idea of playing movie monsters was the one that resonated most strongly for all of us. Over the course of many months, we saw those initial ideas grow into something that we’re really excited about. Along the way, we developed a new element for Savage Worlds that excites us—specifically the way we’ve implemented Witchmarks. We also worked hard to create a campaign setting where the player characters can change the world, while at the same time the characters are transformed by the decisions they make. Our Witchbreeds are certainly based on classic movie monsters, and those films certainly factor as a major influence for us. In general, the classic Universal and Hammer Horror monsters are a primary resource. From fiction, Howard’s Solomon Kane stories played a major influence in the way we developed the setting, but Mignola’s Hellboy and classic fairy tales also fed strongly into the type of world that we envisioned. Finally, the Castlevania line of video games provided a look and feel which certainly has some similarities to the world we sought to create and populate. Some of this was quite a bit of fun. Even when you’re taking notes, watching classic movie monsters is still a lot of fun. Some have a bit of shlock to them, while others just hold up as terrific thrillers. It also meant re-reading some of our other favorite media sources, including comics, short fiction and novels. Going through other many of the other Savage Worlds settings to review how different designers had resolved similar issues was also very useful. As was contacting them to get their feedback. The community of Savage Worlds creators are incredibly supportive and wonderful to work with. Our art direction is clearly far from finished. This is largely because we’re still at the stage of launching the Kickstarter, which we hope will fund the completion of our art acquisition. In spite of that, we have been fortunate enough to work with some incredibly talented artists, particularly Alberto Bontempi who created our cover and archetypes. One of the central goals with the character design was to re-envision these classic monsters in such a way that their humanity and their potential for heroics shown through the horror. Accursed is meant to encompass the Fast, Furious, Fun of Savage Worlds, but it also needs to force the players to make challenging decisions for their characters. Characters can become more powerful monsters by embracing that curse or they can attempt to recover their lost humanity by denying it. Gamemasters need to challenge the players with difficult decisions regarding this. 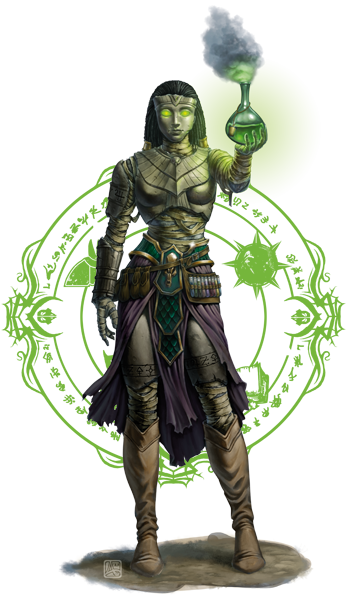 As the PCs act in ways that either deny or embrace their curse, Gamemasters respond by developing the monster’s abilities or by restoring elements of their humanity (at the cost of their monstrous abilities). In essence, it becomes a social pressure cooker for the GM, as he challenges the players with tough choices that have campaign defining ramifications. This creates multiple tiers of play, as the characters can embrace dramatic action at the same time as they make hard decisions. The first point of comparison for this would likely be to other games where the characters play monsters. The obvious examples there are World of Darkness, Stellar Games Nightlife, and Hellboy from GURPS. Accursed are pretty different from all of those. One important element is that our setting is, largely, a fantasy setting with Age of Sail elements and technology. Another important point is that, using the Savage Worlds setting, we’re much more focused on interplaying between the personal drama and the high action and adventure. A Witchmarked might spend significant time considering the curse that binds her, but she also is happy to enthusiastically slaughter a bane created by a Witch of the Grand Coven. Accursed is very much a collaborative effort between Ross, Jason, and John. From the very beginning stages, one person would draft an outline of different portions, and then we would provide feedback and often have long conversations on Skype over different details. This started from the outline stage and has continued on through the draft process. It hasn’t always been easy, as all three of us have strong opinions, and we don’t always agree on everything, but we’re excited about the end result. We feel that, in this case, the game is strong evidence that a good collaboration can develop something extraordinary.